Posted May 19, 2015 & filed under Community Resilience, Emergency Planning, Media Interviews. Trained Road Closure Wardens have legal delegated powers from Nottinghamshire County Council Highways Department to close roads at pre-determined locations when pre-determined triggers are met. 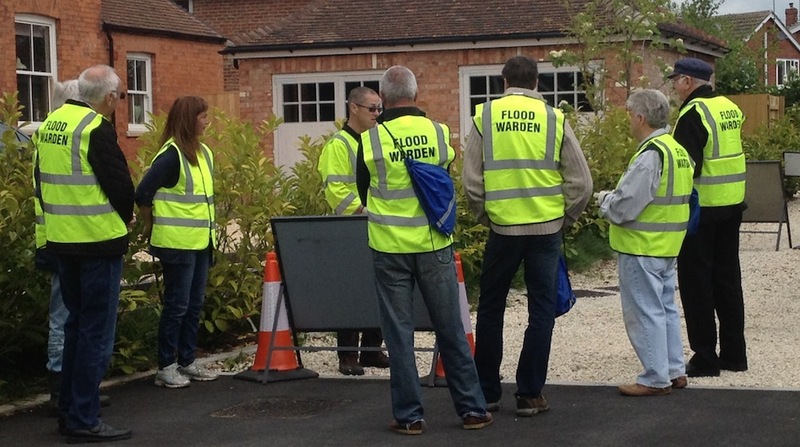 This will effectively prevent loss of life and protect property in all flood risk areas in Southwell. Road Closure signage is stored at strategic, accessible locations near the road closure points. This signage should not be removed or moved without prior permission of the Southwell Flood Forum Community Emergency Planning Team and should only be deployed by trained Road Closure Wardens. No-one should place themselves at risk. 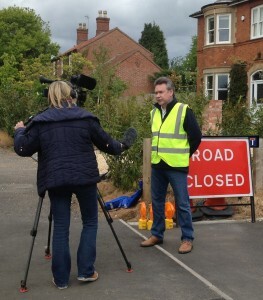 Residents and passing traffic may have been startled to see people in hi-viz jerkins wielding ‘Flood’ and ‘Road Closed’ signs around Southwell on a dry, sunny Sunday. However, there was no cause for panic. This was a ‘dry run’ of the Road Closure Scheme. 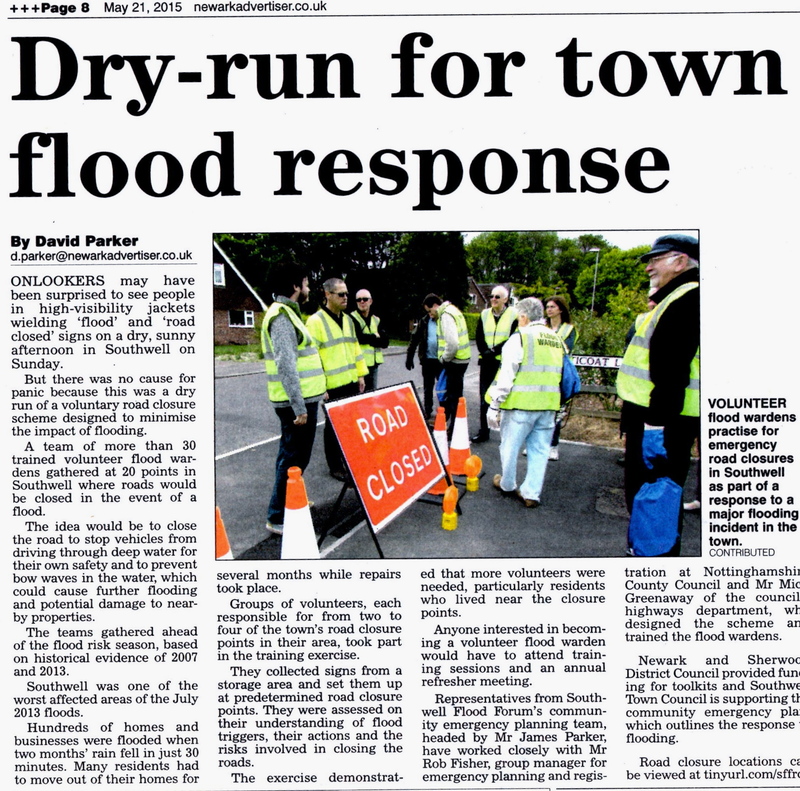 The next day’s heavy rain was a poignant reminder of the reason for the exercise and that we are approaching our flood risk season, based on historical evidence of 2007 and 2013. Over 30 trained Road Closure Wardens met up in their allocated ‘huddles’ – groups of Wardens who are responsible for between 2 and 4 of the town’s 20 road closure points in their vicinity. 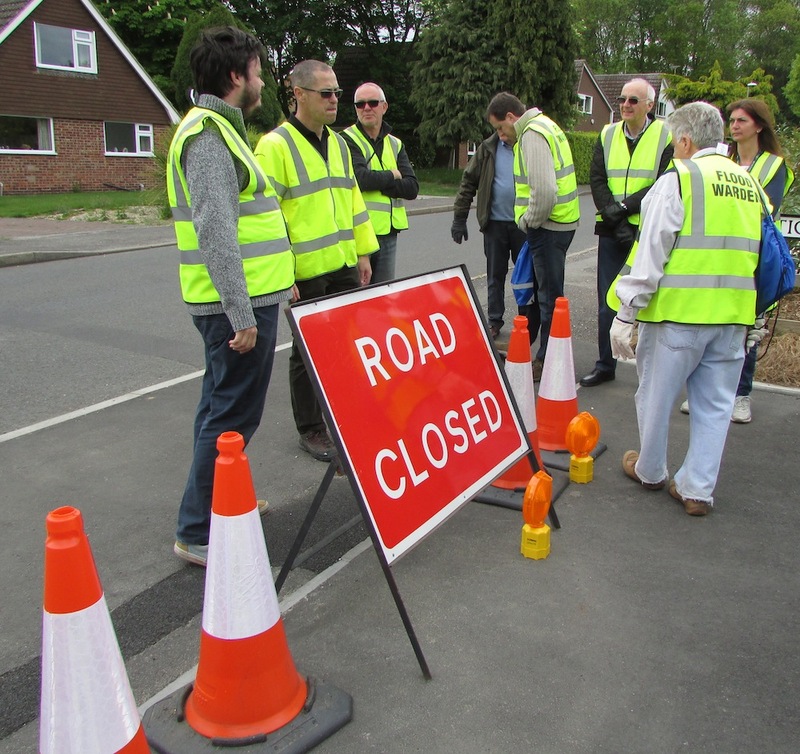 They collected the signage from their local storage area, set them up at predetermined road closure points and were assessed on their understanding of the trigger, action and risks involved when they close the roads in the event of a flood. 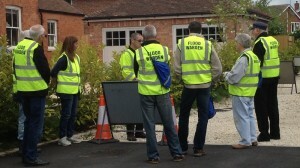 The exercise demonstrated that we still need more volunteers, particularly from residents who live near a closure point. You may have been affected by flooding and be motivated to help reduce the additional impact of cars driving through floodwater creating bow-waves. Most of the closure points are in areas where residents weren’t in all probability flooded themselves and your support will be greatly appreciated by those at risk. 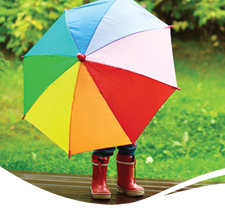 Whatever your situation, we would be glad to hear from you. 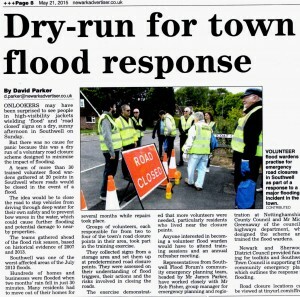 It became even more evident during the Dry Run exercise that time will be of the essence in an emergency and the more trained Wardens who live in close proximity to the closure points, the more likely there will be sufficient people to respond at any given time. You would need to attend one or two training sessions, plus an annual refresher meeting. 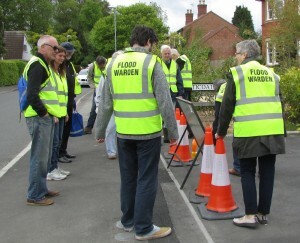 You will be part of a ‘huddle’ who support each other and local residents before, during and after a flooding incident. Representatives from Southwell Flood Forum’s Community Emergency Planning Team, headed by James Parker, have worked closely with Rob Fisher Group Manager for Emergency Planning and Registration at Nottinghamshire County Council and Mick Greenaway of NCC Highways Dept who have been very supportive and helpful in designing the scheme and trained the growing team of Wardens over the past 19 months. Newark and Sherwood District Council have supported this Community Resilience project and helped with funding for toolkits. 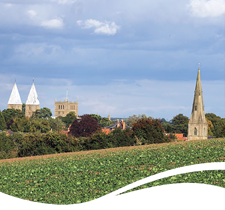 Southwell Town Council are co-operating on the Community Emergency Plan and some Councillors have also trained as Wardens. The Dry Run was a very useful exercise to ‘iron out the wrinkles’ of the scheme, which was carefully planned in the confines of Forum members’ homes and Southwell Fire Station and ‘signed off’ by Nottinghamshire County Council. This final stage made it all feel more ‘real’ when we were actually working in situ and understanding the logistics of the scheme. Getting acquainted with the signage, handling and positioning it correctly. Over the next few weeks we will be making some alterations and adjustments. In due course, we will be running a further training session for new Wardens and those who haven’t been able to attend both of the necessary theory and practical modules.